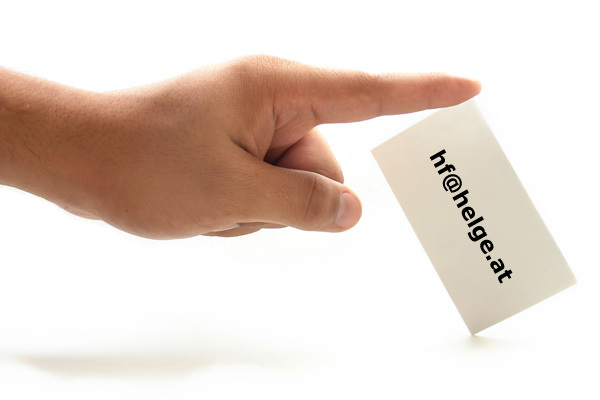 Note that the address information on this page is encoded with the microformat hcard. This blog and website is non-commercial and solely reflects the personal opinion of Helge Fahrnberger. I reserve the right to censor or delete comments whenever i want – usually when they contain unwanted advertising or insulting text. If you don’t like that policy feel free to go somewhere else. Standard settings of the weblog software WordPress, the statistics service Statcounter and the hosting provider Dreamhost are used regarding privacy of your data. Refer to their websites for privacy conventions. Note that cookies are used by these services/programs for statistics and improvements of the user experience. For details see their privacy statements again. Data might be stored outside EU countries, as my provider sits in the US and Statcounter’s servers are whereever they are. Please also note my Email Blogability Policy. All images and text published on this site are available under a Creative Commons Licence – unless where noted otherwise!